I guess HATE is too strong, but I don’t like Santa. It all started years ago when I was working at a group home with teenage foster and probation kids in South Central Los Angeles. I know, the white girl from the farm, in South Central. I was able to see these kids as more than just Gang Members with horrible parents, but human children with potential, talent, hearts and brains. Being raised by grown-up damaged children. I was teased, laughed at, listen to, and trusted. Or knowing that Santa wasn’t real because the Christmas after he turned 5 he sat in the living room, all alone on Christmas morning with no presents because Mom was on a bender and never came home. This probably doesn’t apply to you. You will probably never have a Christmas when your kids don’t have presents. Hopefully. But this year, more kids than ever won’t have presents. And the last thing I would want is for my daughter to carry that message with her to the kids at school who didn’t get presents, for her to think the reason those less fortunate kids didn’t get any gifts during the holidays was because they were bad. And I would never want ANY kid to think that the reason he didn’t get presents was because he’s bad. Even though I don’t like the message that comes along with Santa (and I won’t even go into my fear of Mall Santas and their inherent creepiness) Santa is still an iconic symbol of Christmas. 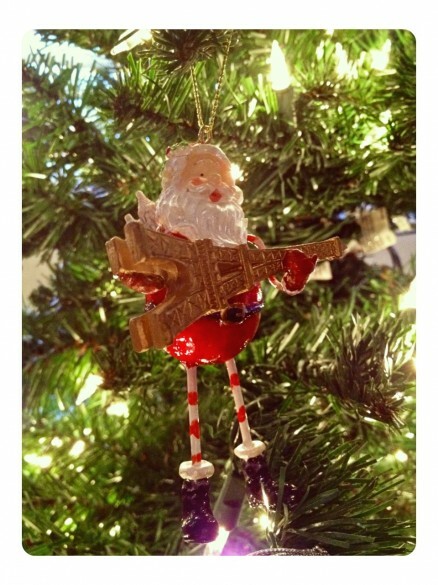 He is a great decoration. Which is why I made these Santa Hat Cookies. I even have one Santa decoration at my house. Just one. I bought it in Paris a few years ago because I really wanted a Christmas Ornament from France and this was all I could find in September. These Cookies are pretty adorable, and really easy to make. Amazing ! Great idea ! This is so cute – but with a christmassy wow factor. Thanks for this post. Cookies are adorable, but your message about the kids was even better. I’ve never even thought about that aspect of the santa tradition and it makes me really sad. Dang. Thank you for sharing that story, its actually very inspiring and a greater motivator to give to those in need during the holidays. Now, these cute little santa hats! Wow. You must live in a warmer climate where you can get strawberries this time of year. Not a chance of finding them in Montana this time of year, or at least not tasty ones. I bet I could improvise though with gum drops though. 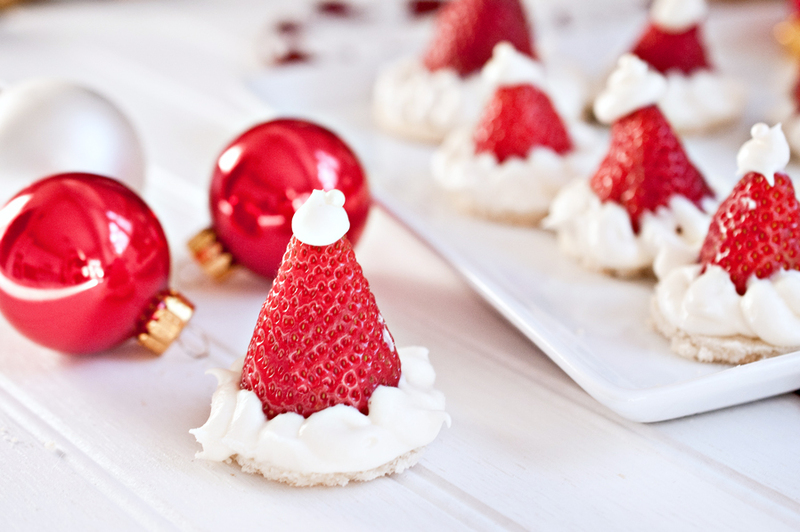 Thanks for such a cute holiday cookie idea! I’m glad you like them! I live in California and we get to have strawberries all year, they are almost always in season here. I had never really thought about it either until I met those boys. But it is so important to be able to see the world from someone else’s point of view, even if it hurts us a little. Looks adorable! I saw a similar concept with Santa Hat brownies on pinterest this morning. I saw those too! Right after I posted this. Isn’t pintrest great?! I’m not sure how much I did for them, but they sure changed me! I still think about them and wish for good things in their lives. I heard from one of the boys who grew up so great. He has a house and a wife, he’s a chef and teaches cooking at the community college! I’m so proud of him! But I have no idea what happened to the rest of them. I just hope they did have as well as that boy did. What an original looking cookie. Wow… Great story! Thanks for sharing. I think everybody kinda needs a dose of “remember what Christmas is ACTUALLY all about” every once in a while because it’s really easy to forget when you’re super stressed out and busy at this time of the year. That’s so great! If everyone who is able to do so gave just a little I really believe there would be no kids who had to go without. The cookies are adorable but the story about the kids is incredible. How thick do we make the disc and how long can the cookies keep before assembly? Amazing story. We gave a couple gifts to foster kids, but it never seems like enough. Make the cookie about 1/2 inch bigger than the base of your strawberries, and about 1/4 inch thick. It really depends on what size strawberries you can find, they vary in size so much. Cookies will spread a bit during baking. Super cute cookies… very smart idea! Your story was so eye-opening and heart breaking, but you ended it with a very positive way to make a difference. I love you for your honesty as well. This couldn’t be more true. It is sad. I always donate toys every year. The thought of a child not having anything to open really makes me want to cry! So glad you are spreading the message and provided links to donate! 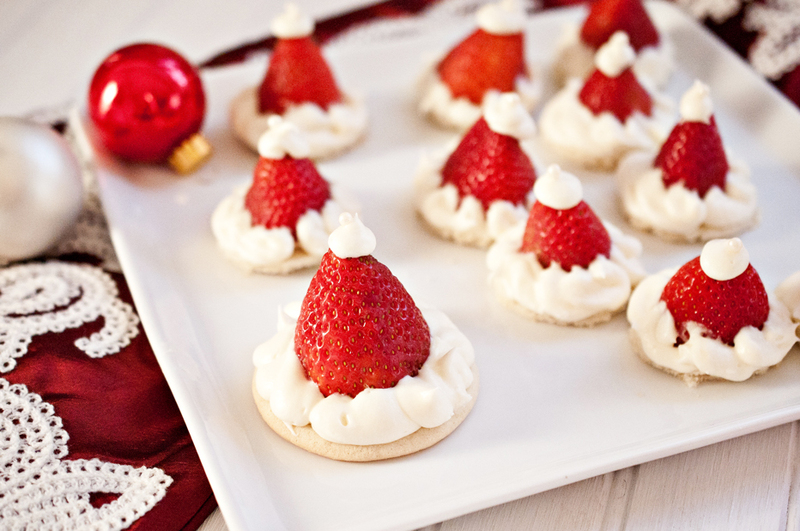 These cookies are so pretty and what a great idea to use the strawberry for the hat! Thank you Stephanie! We all just need to do a little, makes a huge difference. Thank you for your inspriation and story. I baked these cookies tonight. Really cute, but your message about Santa really moved me. You’ll never realize the impact you had on those teens. Thank you for your time, effort and heart. Thank you for your inspiration and story. I baked these cookies tonight. Really cute, but your message about Santa really moved me. When my dad was a tot (in the late 40’s), he was so poor with an absent mother that the only sign of Christmas was the Salvation Army stopping by with oranges and candy canes. I always give to the bell ringers remembering his story. And for you… you’ll never realize the impact you had on those teens. Thank you for your time, effort and heart. That makes me want to give your Dad a hug! It is amazing how many people have a story about something similar to that. I’ve been so inspired by people who are making a move away from the “Commercial Christmas” we all seem to inundated with these days. My daughter is so young, Hope I can figure it out before she gets sucked in! Great post and thanks for the stark reminder. Someone needs to be the conscience of the food bloggers. I nominate you Jackie. p.s. That is an EPIC French Santa. It’s funny how, even when trying to make a huge career move to the food world, I can’t seem to pull my head away from social services. Hope that proves to be a good thing! I love the santa hat cookie idea! I never thought of the downside to the santa hype. Thanks for sharing. Your story really puts things into perspective. Your husband shared this with me today. I totally get it now. You are awesome and both your hearts touch mine. I will never look at Santa the same. Beautiful post. Out of curiosity, do you do Santa with your child? She is really little, only 20 months, so it’s not an issue right now. I really hope to focus on doing this for other, the giving aspect rather than the getting. 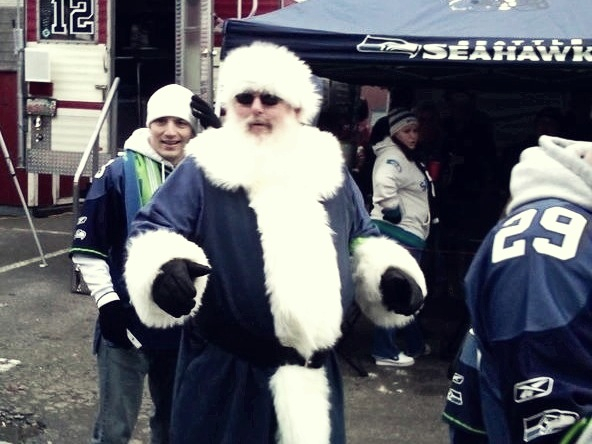 I’m going to let Santa be a character rather than a real person. I don’t want to lie to her about anything and pretending that she has a relationship with a man who loves her, who doesn’t really exist just doesn’t sit right with me. It can be a game we play together rather than trying to convince her of a lie. Jackie you are an inspiration and quite honestly it is refreshing to see someone who gets the true meaning of Christmas. I think it’s admirable to volunteer and speaking your mind is never a bad thing. The cookies are adorable. These are so cute and your story was awesome – stumbled across the post and so glad I did – have a wonderful Christmas! Thats so great! And Happy Birthday to your friend! What a great post, certainly an eye-opener. It’s very unfortunate that not every child is able to live ” the magic” of Christmas. There’s nothing that makes me sadder than seeing a child’s hopes and dreams shattered to pieces. Of course you can 🙂 I’ve even heard of people using Nilla wafers. I totally agree with your dislike of Santa myth. After being a foster parent and having heard this so many times….I didn’t get any presents because I was too bad….I finally started telling kids the truth. Some people didn’t understand why and I was careful to tell them that mommy and daddy are Santa and they probably didn’t have the money but it wasn’t because they were bad. I love these cookies and plan on making them because I love strawberries and I just tell kids that we can all be Santa and give kids presents and do the Samaritans Purse, Operation Christmas Child Shoebox where you fill these boxes and they go to needy kids all over the world. It is a Christian organization but that works for me. We fill a shoebox picking a boy or girl and age. We fill the box with appropriate toys and gifts and put a photo in so they know that I care. 🙂 I can help one child.